Something happened to me last week. I became a writer. I didn’t get a job or a book contract. Nothing actually changed at all except for my mindset. I haven’t been paid for writing in decades, and yet, I still write. I write because it is what I like to do. And therefore, I am a writer, damn it! I spent a lot of time writing when I was employed in corporate communications, marketing, advertising and public relations. But in all those years, I never, ever, considered myself a writer. I wrote, sometimes all day, always with research and deadlines, and never about anything that moved me. When I quit working to give birth to Firstborn Daughter, I remember thinking, “Nothing I wrote made any difference in the world.” I cleaned out my desk and threw my work in the trash, something I still don’t regret. Since the end of my paid employment, I raised three children, lived in three countries, moved about ten times, and always wrote. I wrote for myself, developing ideas for novels and a screenplay and even a comedy sitcom, for which the treatment is still buried somewhere in the back of my filing cabinet along with other writings I deemed worthy of keeping. My writing still didn’t make a difference in the world, but it made a difference to me. Very little of my writing was, or still is, read by anyone except me. There are the annual Valentine letters, charity auction descriptions, this blog…an audience consisting mostly of my family and friends. And since I’m not paid, nor is anyone editing and overseeing my work, calling myself a writer seemed just plain silly. I couldn’t be a writer if I wasn’t paid and no one read my writing. So I thought. In a case of timing-is-everything, I got an email that day from “Christine.” She had seen my blog and wanted to know if I was interested in writing about coconut flour. Seriously. The same day I put the recipe on the counter, I got an email about coconut flour from a stranger who had read my blog. So I went to her page and voila! My problem was solved. I learned that you should only substitute 20-25% of flour with coconut flour. I also learned other cool info and health benefits of coconut flour. So with thanks to Christine and her coconut flour email, I present to you my Blueberry Lemon Delicious Pudding. It’s gluten-free, grain-free and of course, includes coconut flour. And just so you know, Christine isn’t paying me or even promising me anything. But knowing that someone is out there listening is sometimes all the payment we need to keep writing. Or in this case, to call myself a writer. “I write to give myself strength. I write to be the characters that I am not. In Australia, a popular dish that I was served at friends’ homes was Lemon Delicious Pudding. 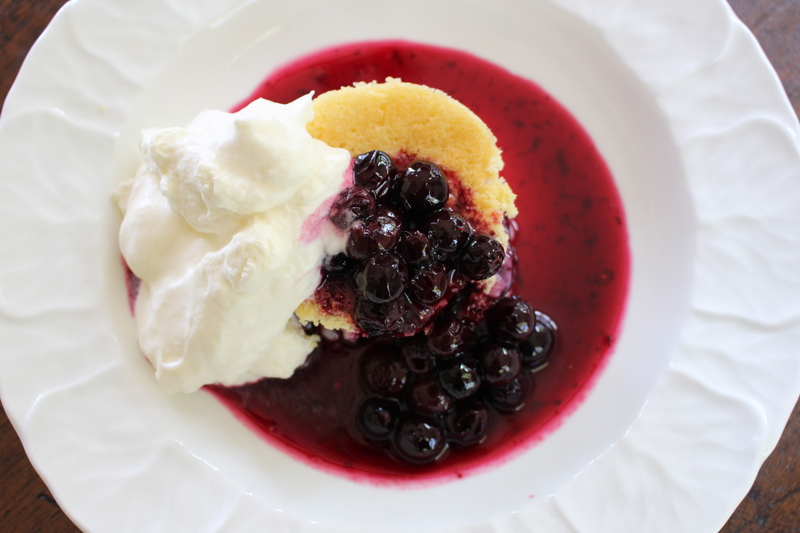 When I saw a recipe for Huckleberry Lemon Pudding Cake in the cookbook “The Wild Table” , it reminded me of those lemony delicious days in Australia. I adapted that recipe and was very pleased with the results. The pudding is indeed delicious on it’s own, but it is double and triple delicious if you add the compote and cream. Spread blueberries in dish, covering bottom in a single layer. Place the dish in a roasting pan just larger than the dish and with sides at least as high. Boil a kettle of water and turn off to cool while preparing the pudding. Cream the butter, sugar, salt and lemon zest in a standing mixer with the paddle attachment. Add the egg yolks one at a time, beating well after each. Add the coconut flour, tapioca flour, milk and lemon juice, mixing well after each addition. Pour batter into a large bowl. Wash and dry the bowl of the mixer. Using the whip attachment, whip the egg whites until they hold firm peaks. Fold 1/3 of the egg white gently into the batter. Thoroughly but gently fold in the rest of the egg whites. Place the roasting pan with the baking dish inside on the shelf of the oven and then pour the hot water from the kettle in the pan to come 1/2 way up the side of the baking dish. Bake for 50-60 minutes or until the top is puffed and golden. Can be refrigerated or served at room temperature by scooping out with a large spoon, spooning compote and whipped cream on top. I love your writing! It’s as great as you are! I always love reading your blog. Your writing is personal and engaging and really high quality! You know I’m a fan, and I look forward to all the good stories you have yet to write. Thank you Jo! I am a fan of you!!! You absolutely ARE a writer and a darn entertaining one, providing lovely stories of family and friends, plus truly delish recipes! Cynthia, I have written before to thank you for your wonderful blog – the reason being that you are a wonderful writer and I read each new blog post with great enjoyment. You seem to write so effortlessly and I have come to realise why I enjoy your posts so much – you are a very gifted and wonderful story teller! Thank you again, and please do not stop your writings – they are eagerly anticipated and much enjoyed! Your kind words are very inspiring. Thank you Sue! 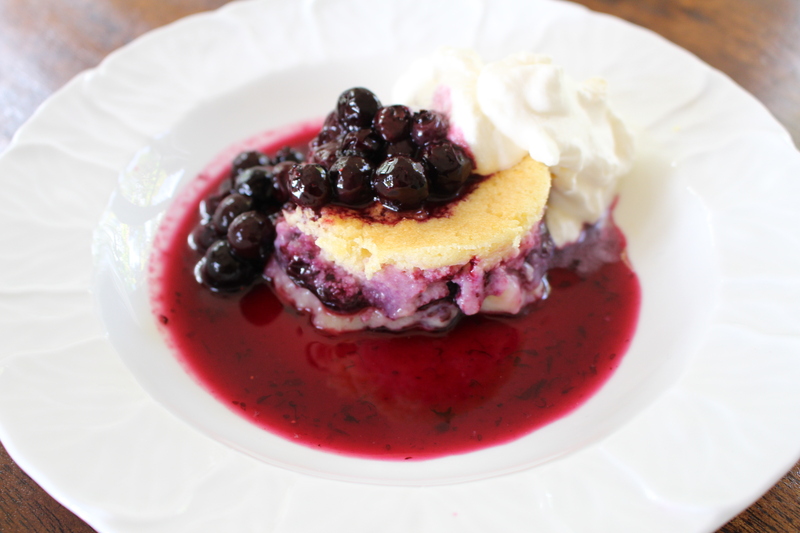 I’ve personally tasted your Blueberry Lemon Delicious Pudding and can vouch for its yumminess!